I was thinking today about Bitcoin as a government currency. Particularly, when it comes to using it as a government currency. I think, if I was starting a new country, or looking to replace my countries currency… I would use something based on either Bitcoin or Litecoin. I’ll call it GovCoin for the sake of this blog post. The currency would be self regulated in the same way Bitcoin is. The downside to this is the same downside you have to any currency that can’t be manipulated: you can’t stop panics or bubbles. But I’ll take panics and bubbles any day over having my money easily manipulated by the government. The one change I would make to GovCoin is how the transactions work. I would set it up so that on every transactions, either a fix feed or a percentage was taken out of the transaction. This would basically amount to a sales tax, but done on every transaction, similar to how Visa does discount rates. Every citizen would have their own “pay in” ID that must be included with the transaction that is assigned they are issued a wallet. This would make it possible track how much you’ve paid in easily, either for refund purposes (tax-exempt organizations), or simply for your own reporting. The downside to this is the damage to free trade caused by imposing a transaction tax… but I believe the costs savings of not really needing an IRS could more than make up for it. The other catch 22… Dealing with other currencies in your country. The only real solution to this problem is to not allow business to be transacted in other currencies… I’m okay with that… There will be international companies that are able to get around taxes by doing things in other currencies… I’m okay with that. As long as they are forced to pay their employees in our country in bitcoin, and all the stores online and off, require govcoin… If it’s an international transaction, then there would probably need to be some sort of “flat govcoin tax” for bringing it into the country (like reverse postage). I would use mining to help keep the classes balanced more than they are now. I would look at possibly making mining exponentially harder, the more you tried to do it as a pool or individual… Thus allowing the automated distribution of wealth (lottery) to be equal among the citizens… Maybe even making it somewhat based on how many transactions (or better, how much) you engaged in (inversely)…. This would somewhat create an automated redistribution of wealth… As the richest people in the country would no longer find it worth while to mine (most likely, as their odds would be hurt by the amount of the transactions they engage in), and the poorest people could mine to possibly collect a ‘minimum wage’. Don’t get me wrong… it’s tricky… and you don’t want everyone simply relying on generating currency (that wouldn’t work)… But it’s a more “practical” way to hand out money to people than say… straight up hand outs or subsisdies…. At least this way, if they simply take the money and go and spend it like mad, they have less a chance of getting more free money… But if it works, you’ve pretty much eliminated the need for government programs that are simply there to hand out money. (You might still need some public education programs like… public education… might… being the keyword). I’m not sure it would work… but… If I had a couple billion dollars and some land to try it out on… It would be a fun experiment… Wonder if a commune could pull it off legally inside state borders. It has been awhile since I have taken the time to write here. Much has happened over the summer, most of which you could label as “busy”. I haven’t given up on my home automation dreams, in fact, my latest improvement was moving the Raspberry Pi out of my office and into the basement. There it continues to collect data, and powers my bitcoin miner (which also doubles as a space heater). In terms of other things I wish to automate going forward… I really want to get to the point where I have my home’s Christmas lights do cool things. That said, I don’t have $1000’s of dollars to spend just yet, so I’m going to take it year by year I guess to make it happen. This year, I focused on getting the trim decked out with some new LED lighting. The biggest issue I’ve run into though is electricity… For some strange reason, there are no outlets on the outside of our house. At least, non that are useful. Next summer, I’ll need to look into changing that. I’ll try to do it with the goal in mind of being able to run lots of cable (not just electrical) to my future winter scenes. I’m also kind of wondering what my neighbor’s do for Christmas. This being the first year in our home, and the first year I’ve been able to decorate, I’m kind of concerned that I may eventually do “to much” (is there such a thing)? In other news: Link continues to get older. Ellie seems to as well, but I swear not as fast as it went with Link. I feel like Link could be starting 1st grade any day now (okay, maybe not). Being a father is a new challenge every day. But it’s one I am very much enjoying. It’s been awhile since I last posted… And much has changed. First, I made the decision to go with a RaspberryPi for the server that would be running everything. It was so simple to get running right away the way I wanted it’s crazy. So let’s talk about what it is I “got running”. Installed “Raspbian” (Debian for RaspberryPi). This was very very straight forward. Installed my typical LAMP setup (Linux, Apache, Mysql, and PHP). 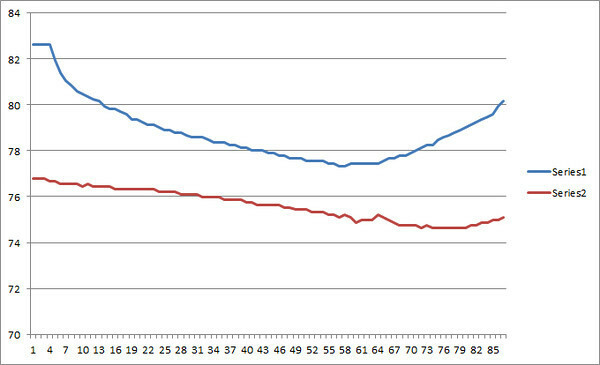 With PHP I included GD libraries (for graphing), and the CURL libraries (for communication with my thermostat). I then installed OWFS. It’s a nifty software package to aid in communicating with 1-wire devices (such as my temperature sensors). I then installed the PHP module for OWFS (so I could talk to it directly from PHP without to much additional hassle. And lastly, I installed phpMyAdmin, just to save myself some time managing the mysql databases I intend to create. 1) Pinged each sensor for it’s current temperature. 2) Logged that to a MySQL table. 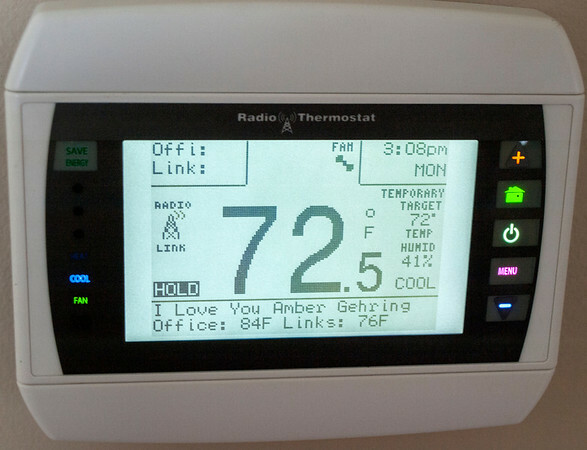 3) Pinged my Thermostat with the updated temps to allow me to see the updated temps on the display. You would think I would stop there… but I have a long term goal of having this data easily viewable from the web. And while remotely accessing my RaspberryPi from outside my home is already possible… it’s not exactly how I want to be serving up webpages to the general public. So I needed to find a way to mirror the data to a real web server, in a near-realtime, fault tolerant way. I considered simply having my php script talk directly to a remote web server via a remote MySQL connection… but that had the problem that it would stop logging data in the event of an internet outage. So instead, I went back to my favorite way of replicating MySQL data… MySQL Replication. 2) A Mysql Replication interface so you could start and stop replication without having to look up the “index number” and then run the various commands to start the replication. Those were both some great time savers. There was one other development in this project that came up in the last week, which I’ll address in my next post. We ended up deciding to replace our Air Conditioner. That’s got it’s own mini story, and isn’t entirely something that was done as part of the home automation project… But it was something that needed to be done non the less. But your here to hear about how my home automation project is going. The new thermostat arrived and we got it installed. It solved the problem of our A/C running 24/7. I also adjusted our blower speed on our furnance, and that too seems to have helped to keep our house cool as the daytime temps are now getting into the 80’s. I still think it’s running far to often, and not cooling as fast as it should, but we’ll get that squared away soon. In any case, I’m hoping that the remaining temperature sensors come in the mail later today and that I get some time tonight to wire them all up. If they do, I should be in a pretty good position to start logging the temperature from pretty much every room possibly as early as tomorrow. Then it will be on to phase 2… Coming up with solutions to reduce the power consumption, while increase the cooling… Whole Home Fan Anyone? Today’s goal was to get the 2 sensors I had working last night, working in other rooms. We don’t use any land-line phones (but even if we did, there’s enough extra cable that I could have 1 phone line and the sensors if I really wanted to. All the phone lines should be in parallel, which is what is needed for wiring these things together. There’s on average 1 jack per room (which is what I want to record). The lines are already in the walls (big time saver). I made the decision to actually use 3 wires going back to the computer (as opposed to just 2). This will allow me to change the circuit in the future from parasitic power to non-parasitic power without having to rebuild all my sensors. If you want to read more about the 2 versions of the circuit that I’m playing with, read the first half of this article. The first thing I did was take a trip outside to customer demark point for the houses phone lines. There I disconnected the phone service completely from my house (just unplugged the cables for the 2 lines that were previously installed). Even though my service was already stopped, these lines needed to be physically disconnected. While they were still plugged in, my home phone network was grounded and possibly even still getting power from the phone company (not sure, didn’t take the time to measure, just know it had to be disconnected for my circuit to only be “my circuit”). From there, I went upstairs and started plugging in my components. I made an adapter to go from my 1-wire serial interface to an RJ-11 (making note to get the pins right). I then plugged my adapter into the wall, and took my sensor to another room in hopes that it would again just magically work. So off came the plates from the wall jacks. Much to my surprise I discovered 2 things that I find far to often in the low voltage world. 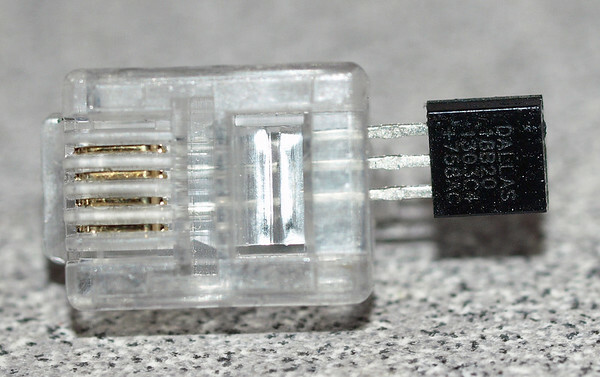 First, they hadn’t wired all 4 pins of the phone jacks… just the 2 middle pins (all that is needed for a single line). While this isn’t entirely uncommon, it really is someone deciding to be lazy. There’s no reason NOT to wire all 4 pins properly other than time. Since I had decided to use 3 wires for this project, this meant I would need to go to every jack and wire in the extra set of wires that were just sitting there. The second thing that I discovered in *some* of the jacks, is that for some reason, the person installing them got a little color blind (or something… I’m not sure). In any case, they started mixing and matching colors… And while it was *probably* functionally correct (I’m not positive on that), it was definitely not a normal thing to do… And became highly frustrating when trying to figure out if the pin mapping at each jack was correct because suddenly red wasn’t red, and yellow wasn’t yellow. In any case, I redid any I saw that were wrong as well… and so far, so good. I presently am able to use my sensors in any room on the bedroom level. I’ll do the main level and basement hopefully tomorrow night. I’m also hoping my new Thermostat will arrive tomorrow. If it does, I might even go so far as to writing some simple programming that will allow me to display the temp of the other 2 sensors on thermostat’s screen (it has that ability). However, that’s going to be hard if I don’t get a Linux box setup for this. So much to do… The screen thing might have to wait til the weekend… We shall see.